What do you do when an inaugural race is being held a short drive from your home, with the potential for a serious PR? Why, you enter it, of course! 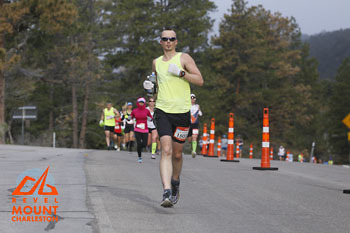 It, in this case, being the Revel Mt Charleston Marathon and Half Marathon. Run Revel race series beat another Race Director to the punch in organizing, and holding the first marathon, and half marathon down Mt. Charleston, down Kyle Canyon Road. Signing up early enough, and creating a team for the Sin City Road Runners, saved me a bit of cash. The Revel Mt Charleston Marathon race expo / packet pickup location was in a community center not too far from work, so I had a few people send me photos of their IDs, so I could pick up their stuff. Arriving at the parking lot, parking was easy, and signs let us right to the area where everything was. Received our bibs without a hitch, then over to the shirt tables. First, the senior lady residing over the ladies’ shirt table was trying to shoo me away to the men’s table. After getting her to understand what I was doing, I received the women’s gear, and went over to get mine. It was awesome that they offered race shirts in three styles: tank top (my favorite), t-shirt, and long sleeve. The shirts looked awesome, and ended up being very comfortable. Knowing the start line was going to have some serious low temperatures, the race organizers went above and beyond for the runners of their Revel Mt Charleston Marathon! They provided everybody with space blankets, throw away gloves, and some pretty cool beanies. Back at the house, my traditional quadruple check all my gear ritual was underway. Making sure my bib, shoes, socks, shirt, shorts, etc were all ready for the next morning. We went out to dinner, and called it a night. Waking up the next morning, we got ready, then jumped in the car for the drive to the finish line / bus pickup location. Here we were, on our way to the inaugural Revel Mt Charelston Marathon. Everything was going fairly well, following a little confusion as to where to park for the half and full anyway. Hopped in line for the bus, and ended up seeing some acquaintances from run group, and previous races. We chatted on the way up the mountain, enjoying the distraction from the darkness. At the top, we exited into a brisk, but not super cold morning, atop Mt Charleston. Shockingly, I ran into another running friend that I had not seen in years! The day was starting out well. Chatting with David from the SCRR Wednesday night group, at the aid station he was working helped pass some time before the start. Gerardo & Massey found me, and we discussed our lofty goals of Boston Qualifying on this seriously downhill course. Working to the middle/front of the start corral, we wished each other well, and let our legs take us on our way! Knowing what I do about myself, trying to throttle my speed on a downhill is just crazy thought. I let myself cruise, gravity did the work, I just controlled fell down the course at a nice clip. Within half a mile, the clouds opened up, and we were gifted a nice flurry of snow for a few miles. Big puffy snow flakes fell upon us, slowly hydrating those who breathed through their mouths. I was feeling good, had a nice open section of road to myself, and did not look at my watch, for fear of subconsciously adjusting my pace, due to excitement or worry. Floating down the mountain, I kept my eyes forward, hoping for the best. It seemed very quick that each mile marker was being overtaken, and my watch beeping near each of them. A little right turn to navigate around a parking lot was added to the course, with a slight climb, before dropping back onto the main road. While we continued on down the mountain, the trees began appearing more sparsely grouped, than higher up. By mile 8, I was having some unhappy intestines, causing a few minute stoppage at one of the course side “condos”. Seems like the previous night’s dinner was not sitting well, despite it being a meal I had eaten there many times before. Exiting with a freedom, and a different type of urgency, I looked at my watch, and realized a 5:30 pace was not sustainable. Dialing it back, I settled back into a good pace. 13.1 Miles Down – Halfway There! At the half start point, my stomach revolted again, causing me to lose more time. I didn’t leave that condo with as much of a sprint, as I watched my Revel Mt Charleston Marathon BQ goals slip away in that plastic house. My fantasy goal for the day was gone, however, many other marathon race goals were still attainable. With a different mindset, I set my legs on an efficient cruise control, that would still get me to the finish line with quite a personal best. When we turned off Kyle Canyon Road, I spotted a former SCRR runner, and another member of the local running community. We chatted for a second, before they continued on at his pace. I had a slower, but stutteringly steady pace. Talking with another runner, as we pushed on through the warmer morning, the two of us tried to motivate the other, to keep running. 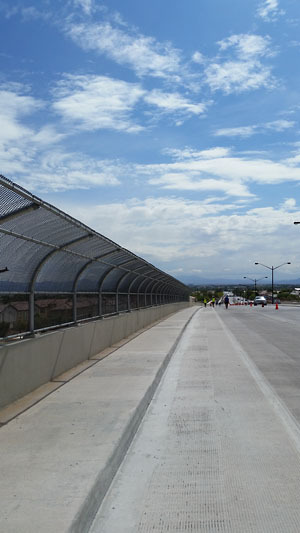 As we were “climbing” the second of two overpasses, I overheard some half marathon runners commenting about how they had two big hills on their run. It is interesting to hear what others consider big hills! 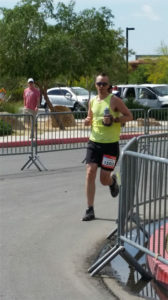 After running races in Lake Mead, and elsewhere, featuring some serious climbs. It seemed like so many miles were ran on those roads. We still enjoyed a net elevation loss during those miles, just at a much reduced grade than atop Mount Charleston. The sun was out in pretty good strength, intensifying the warmer temperatures. This would have been a perfect time for cloud cover, and a light drizzle. Something I try to remember, is to thank aid station volunteers, who deftly assist runners, as I pass them. I couldn’t help but want to be done with this race. It happens fairly often, especially at these races where I don’t fully train beforehand. I get bored, tired, and question why I keep doing this to myself. Continuing on, I began seeing runners with medals walking against the course, cheering us on, and looking for their friends, and family still on the course. This gave me access to more energy, knowing the finish line couldn’t be far now. Running on a shaded sidewalk felt so nice, after being in the sun for a time. I could see runners ahead of me making a left turn into a parking lot. Focusing on my surroundings, versus my mind, I could hear the MC urging runners on, and announcing finishers. YES! Almost there. Starting around half a mile out my legs started turning over quickly again. I made the left into the park’s parking lot, with a second left into the finish chute right after that. My feet were moving along quickly, even more so once the race clock was in view. I wanted to smash my previous full marathon personal record by as much as possible! 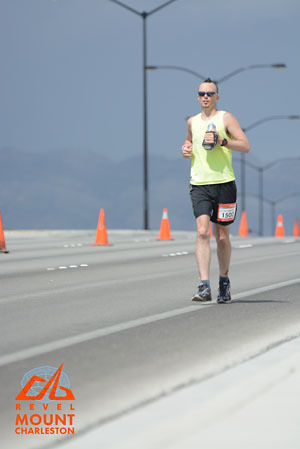 Dodging around a couple other runners, I crossed the line, tired, yet elated for another marathon under my belt. 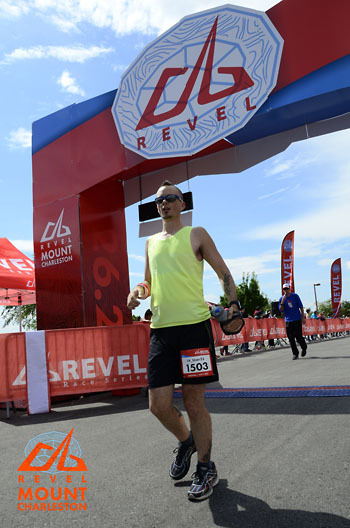 Revel’s race photographer camped at the finish line caught my favorite finish line photo to date, of myself. When looking at the photo, I get the impression of Clark Kent transitioning to Superman; chest out, arms ripping the work shirt off. Race Mission – PR: Complete! Another awesome part of the Revel Mt Charleston Marathon was the finish line announcer. He had so much energy, so much enthusiasm, it was great. The guy knew what runners’ BQ times were, which would urge runners to finish strong, and get that BQ, or get their PR. He was an asset to the race. Following the food tables after the medal distributors, I got into the massage line. This is when the clouds covered the sky, and decided to give us a little sprinkle. This bit of rain was still a welcomed bit of precipitation! The post-race massage was much needed, especially as my calves were cramping up from the immediate downhill, to standing transition. In line, we talked with other finishers, strangers, and friends alike about our experiences, why I was in front of Gerardo & Massey, yet finished 20 minutes after them. It is amazing what 12 minutes of sitting will do to a race time & position. All, in all, this was a fantastic inaugural event. 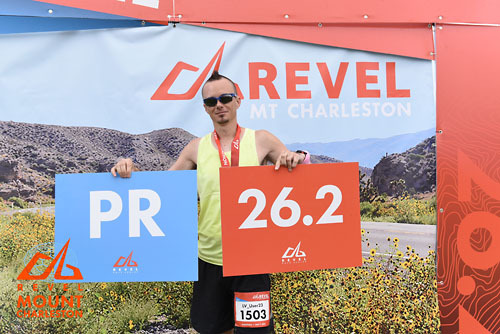 With more training, and better luck with how my previous night’s meal sits… I can see nailing another PR, and perhaps a BQ in 2017 on the Revel Mt Charleston marathon course.